Working at a gym has completely renewed my appreciation for showers. On Tuesday mornings I lead a beginner’s running group on a 5K run at 9 a.m. Though 9 a.m. may not seem that late in the day, it’s late enough in the morning for the humidity and heat to be raging in Ocala. Everyone returns from the run absolutely dripping sweat. Unfortunately I often don’t have time to shower between this quick run and my first personal training client of the day, so the sweat ends up drying on my body until I work up a sweat again teaching water fitness after lunch. I’m pretty sure I spent the entire cool down song of today’s water fitness class fantasizing about my shower. I felt absolutely disgusting, but I’ve come to realize that the nastier I feel pre-shower, the more amazing my shower feels. It’s like that quote, “Without the bitter, the sweet ain’t as sweet.” Without nasty dried sweat, my shower ain’t as sweet. Now I feel clean and glorious and life is good! Other than feeling like a gross mess, work today went well. I think that may be my workout tomorrow! Lunch today was enjoyed in the break room. 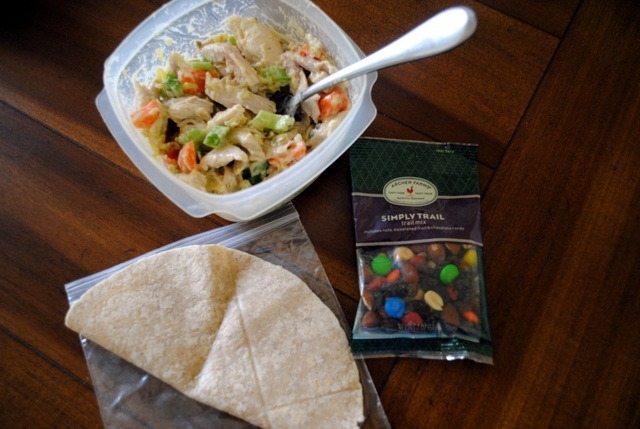 I packed myself chicken salad that I made using leftover chicken from last night’s oven roasted chicken dinner. I wrapped it up in a whole wheat tortilla and enjoyed it with a side of trail mix. Hope you guys are having a lovely Tuesday! I just can’t get enough of these functional training workouts! That’s awesome!!! Good luck to you, Jamie! 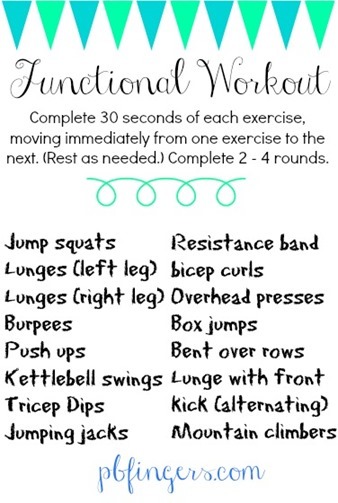 Functional workouts are my fave! Looks like a fun one! LOVE that trail mix… It’s dangerously addicting! Love the workout!!! Definitely need to do some more rep and time challenges to keep myself motivated! That is so true about showering. I would pretty much pass out if I had to go for a run at 9am this time of year. I remember when I would train and teach back to back . I was so busy but it was lots of fun. This workout looks awesome! I have a few of your bootcamp workouts on the agenda for this week! I can totally understand the feeling of a shower! I now on days when I can’t get a shower right after and wait around, they are the best showers ever!! Love your functional workouts! This one is great because it can be done almost anywhere. That chicken salad looks pretty good. It always feels like I’m cheating when I use leftovers in another meal, though it’s always nice that it cuts down on the prep time. That kind of training is so good because it’s just beneficial for everyday life in general! And your salad looks so delicious, I must be getting hungry. Love the functional workouts you’ve been posting. I’m curious…what is your take on Crossfit? Keep the functional workouts coming! This one looks like a killer. Can’t wait to try it! Hope you enjoy it, Erika! 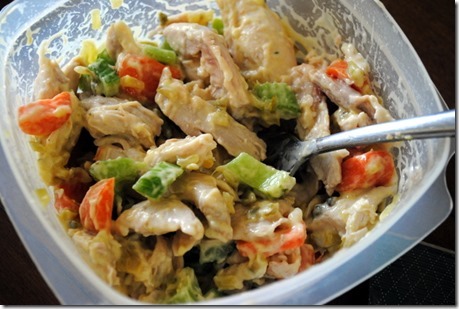 I think chicken salad might be in my near future too–mmmm! I love functional training workouts! They keep me moving and interested, which makes the workout more fun! And speaking of feeling gross, I haven’t gotten a shower after my workout yet (which was before lunch). So I’m gonna do that right about now. This looks like a killer workout! I have a love hate relationship with burpees! I’ve not had breakfast yet so now looking at your food is making me even hungrier! I should probably fantasize more about a shower. I have a BAD habit of sitting around in sweaty workout gear wayyy too often! Oh yuck! Being sweaty all day definitely does not sound fun. I ran at about 9 today too and I was SO sweaty and gross after. I can’t imagine not being able to shower right after that! At least you work at a gym, though, so people can expect you to not be perfectly made up. I hate being in my sweaty clothes after working out, it is probably the worst feeling! Love your workouts! I imagine that is such a rewarding job to have even though I’m sure the hours are kind of crazy! I have thought about doing personal training several times but never followed through with it. You are awesome! Have you ever considered sharing a water fitness workout on the site? My gym doesn’t have a class like this, and I’ve just recently started trying to work out more in my pool. I would love some exercises to run through – more than just swimming laps. 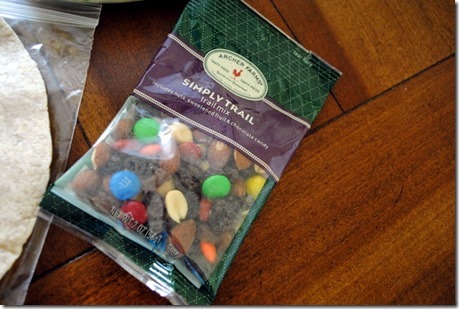 I love those little trail mixes from target! Love functional workouts! Thanks for posting! One question – do you ever notice your skin breaking out from all the sweating and not showering? My complexion would be a disaster! I try my best to wash my face in the bathroom quickly, which I think helps a little bit, but YES. My skin has seen better days. I probably stay in my workout clothes a little bit longer than I should, but it does feel do good to get out of them. Love functional workouts and your salad looks good! I have to say, I’m guilty of staying in my sweaty workout clothes for the remainder of the day. With a three year old, it leaves little time for a shower! Lovin all your workouts, can’t wait to try this one out! Question, what do you use to make the cute postings of the routine? I know I use picmonkey a lot to edit pictures, but didn’t know if you used another program to create them. Thanks, Julie! Do you have any tips for making good Chicken Salad? I totes attempted to make it the other day and it just tasted like carrots, mayo and celery with chicken. Lack of flavor/combination! Help! 🙂 Thanks! Yup…I totally get you on the shower thing. After a sweaty workout, I always feel so much better once I shower. It’s kind of amazing! Love that workout. I got to try that out asap! BTW…the chicken salad looks delish! Think you could do a workout playlist updated post soon? Love your blog! I literally rushed around into town and back this morning, leapt into my car to drive to my Mum’s and fantasized about the shower I would have when I got there the whole journey! Nothing better than a long-awaited shower! Thanks for posting this workout! I think I’ll do this tonight at the gym. Love functional workouts! I think making chicken salad is one of my favorite and easiest ways to use leftover chicken. I actually am going to eat that today for lunch. And I totally agree – a shower feels the best after a hot, sweaty run!! I am so glad I discovered your blog by accident a couple of months ago. I’m 23 and currently working for RCCL as a singer/dancer and trying to stay healthy in a job where food options aren’t always the most accommodating. I have found your workout routines have sparked a drive in me to do my best to stay fit and active and healthy even when it might not be the easiest thing to do! Thanks for covering so many topics too. I have recommended your site to literally ALL of my friends and enjoy making your recipes whenever I’m home on land. Thanks again Julie! These functional workouts are great! I come from a crossfit background and just recently quit so that I could get more variety in my workouts. They sure are fun to throw in here and there though! I’m so jealous of your active job! Just had to tell you I tried this functional workout yesterday and whew I was sweating!! Loved it!! I just did this functional workout for the second time in a week and it doesn’t fail to leave me in a puddle of sweat and breathing heavy! Thanks for posting it! I love functional workouts and am always looking for new ones so I don’t fall back to what’s easy for me. The best part about them is that you need little to no equipment and get a great workout.